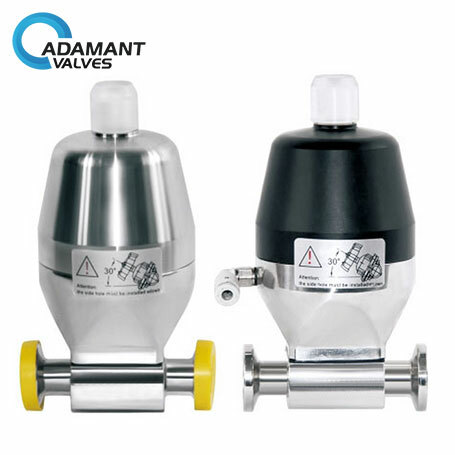 Adamant Valves is a professional sanitary valves manufacturer specialized in manufacturing a wide range of sanitary butterfly valves and sanitary ball valves. What kinds of valves are used in different industries? How to Prolong the Service Life of Sanitary Fittings? How to Select a Right Sanitary Check Valve? Sanitary valve adopts the clamp type. It has the advantages of simple structure, beautiful appearance, quick assembly and disassembly, quick switch, flexible operation, small fluid resistance, safe and reliable use. Its steel parts are made of acid-proof stainless steel, and the sealing parts are made of food silicone rubber or polytetrafluoroethylene material, which conforms to food safety standard. It’s widely used in food, wine, beverages, dairy products, fine chemicals, pharmaceutical, and biological engineering and many other industries. Sanitary pneumatic diaphragm valve consists of sanitary diaphragm valve and pneumatic actuator. It uses the compressed air as the driving force to regulate the flow of fluid medium in the pipeline. Since valve body that has a corrosion-resistant lining and diaphragm that is corrosion-resistant are used in the structure, and there’s no stuffing structure, the throttle element is elastic diaphragm, the flow channel of the valve body is smooth, pneumatic diaphragm valve has the advantages of small resistance, large flow, no leakage, convenience and reliability, fire-and explosion-proof. It’s widely used for flow regulation in industrial automation systems that contain strong acid, strong alkali, strong corrosion, high viscosity, glumes, fiber, and toxic media. Adamant Valves company devotes itself into food safety and the public health career. Our mission is to develop and improve hygienic equipment for the food, beverage, and pharmaceutical industries. 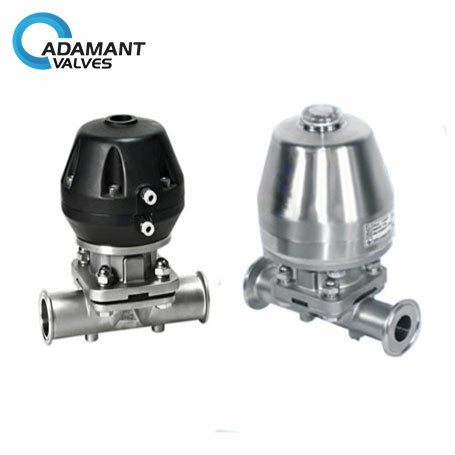 Adamant valves is mainly engaged in manufacturing and selling all kinds of sanitary butterfly valves, sanitary ball valve, sanitary check valves, sanitary diaphragm valves, sanitary fittings and sanitary pumps. Copyright © 2002-2018 Adamant Valves, All Rights Reserved.